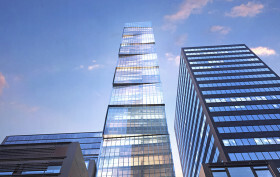 Construction and sales have commenced on a glass-encased, 500-foot-tall condominium tower at 118 East 59th Street developed by Euro Properties and designed by Soo K. Chan of SCDA Architects. Situated mid block between Park and Lexington Avenues, the tower is surrounded by the crème de la crème of New York real estate, positioned within the nexus of several high-value locales: The Plaza District, home to the GM Building, commands the city’s top office rents; nearby shopping stretches of Fifth and Madison Avenues hold the world’s most coveted retail corners; and a one-mile long, super-luxury residential corridor, nicknamed Billionaires’ Row, straddles the southern bounds of Central Park and is set to reshape the city skyline into a trophy shelf of wealth. 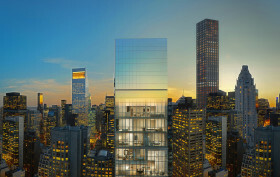 Last November, 6sqft brought you news that a 29-unit boutique condominium would rise at the edge of Billionaires’ Row, in that somewhat ambiguous zone occupied by Bloomingdale’s and Bloomberg LLP. Now, the high-end development’s teaser site has launched, which showcases a handful of images of the tower’s common spaces, and we took a trip to the site to get a first look at the construction progress. Just last month, the two 4- and 6-story office buildings occupying the site at 116-118 East 59th Street were cleared, and recent Department of Buildings filings reveal that the envisioned $330 million tower will stand exactly 500 feet tall, making it spot-on-the-mark of what we (and other bean-counters) officially deem a skyscraper.